So you want an urban garden: Where do you begin? 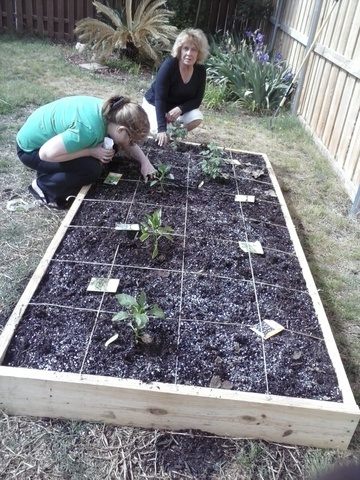 Crystal Carel, a Garland resident, plants her urban garden as Liz Berry watches. Crystal's urban garden is contained in a 4' x 7' x 8 in high wooden bed. Her soil is a 1/3 vermiculite, 1/3 sphagnum moss and 1/3 mixture of compost and garden soil. However, the structure, soil content and plants can be as varied as the urban gardeners themselves. Whether you rent or own and whether you live in an apartment or in a home, you can have a urban garden. If you've never gardened before, it's usually wise to start small (with one 4' x 8' raised bed or a few containers) and then grow from there the next season. First learn about the rules governing the use of the property where you hope to establish the garden. 1. Do you own or rent? If you rent, you must consult with the owner of the property unless you plan to have a container garden on the patio. 2. If you own, is there an HOA involved? If so consult with their rules before putting in an urban garden. Second, determine the budget for your garden. Like any other hobby, gardening can get expensive, but it doesn't have to. One of the best ways to keep spending in check is to start out with a predetermined amount of money that you are comfortable with spending. While we are on the topic of money, don't expect to get a monetary return on your investment in the first year. Almost without exception, establishing your garden will cost more than you will realize in monetary profit from your harvest. If this bothers you, ask yourself: How much R.O.I. do you get from golf, or tennis, or fishing, or just about any hobby you might undertake? Third, determine your own needs as well as your long-term goals for your garden. For example, you don't like to stoop, you may want to design your beds so they are 2 to 2.5 feet high. If you plan to eventually grow enough fresh vegetables to feed your family of four, you will want to lay out your garden plan to be built over a period of two or three years. When your garden is completely built, what will it look like? Determine the best area of your yard for a garden. Needless to say, it will be an area that gets at least 8 hours of sun every day. 1. Don't dig. Tilling the soil is too much work. Instead, build your garden soil on top of the area where you want to garden. Enclose the garden bed or not? Usually establishing any kind of a border to define the area of your garden will increase the expense. However, there is always the possibility of free or found wood, or other free materials from which you can fashion the sides of your garden bed. 2. Build the soil. There are about as many ways to build soil for a bed as there are gardeners. An expensive way to go is the Mel Bartholomew way: 1/3 vermiculite; 1/3 sphagnum moss; 1/3 compost and garden soil. Soil with this mixture for a 4 ' x 8' bed will cost approximately $60. By the time you figure the cost of the wood for the sides of the bed, the hardware, and the plants, your 4' x 8' garden will cost about $125 to install--not counting labor. The thing to remember when building your soil is that you need something in your soil to aerate it; something in it to retain water; and then of course, something in it to nourish the plants. If your budget is lower than a worm's back, build your soil as we have built the soil in the Winding Garden here at the Garland Community Garden. This urban garden bed has no frame and most of its soil is made from found materials. 1) On a Monday and Tuesday here in Garland, drive around and pick up about 10 garbage bags of leaves and grass clippings curbside. 2) Stop in at the back of liquor stores and other retail stores and pick up cardboard. You will need enough cardboard to cover the bottom of a 4' x 8' bed about 20 times. This will pretty much fill up the trunk of an average car and the inside of the back seat. 3) Drive to Mesquite and pick up a cubic yard of compost for $10. (This is a lot of compost. It is enough to fill the bed of a 3/4 ton pickup. Be sure to bring a tarp to cover it for the trip back to Garland. If you don't have a truck, ask a friend. Talk them into becoming a gardener.) In the future, Loving Garland Green may have a pile of compost that we make available to Garland gardeners who are registered with us. Figure out a way to share this load with several gardeners as you will need only about 1/4 of the load for a 4 x 8 foot bed. 4) Buy two bags (2 cubic feet each) of garden soil. This will cost about $12.00. 5) Wet the cardboard completely so that it is soggy and lay down the first layer in the bed. 6) On top of that layer place a layer of sticks. 8) Water with the hose. 9) Place a layer of leaves. 11) Place another layer of leaves or other dried plant matter. 12) Water with the hose. 13) Place another layer of soggy cardboard. 14) Continue until the bed is about 8 inches high. 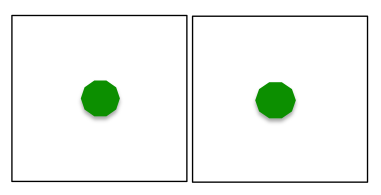 15) Pat the sides all around the bed so they slope toward the inside of the bed. Do this so you can mow around the edges of your bed if needed. 16) Mix the compost and garden soil and spread on top. You should have about 4 inches of this soil on top. 18) Plant with seed and transplants that you've obtained from friends and other free sources. Following this method, it is possible to have an 4' x 8' bed for as low as $20.00. 4. Install Water Conservation Devices. 2) feeding baskets - Fashion a cylinder from chicken wire. The cylinder should be approximately twice the height of the soil in the bed. Reinforce the sides of the wire with bamboo sticks. Place the cylinder into the soil so that its bottom is resting on the bottom of the bed. Place wet soggy cardboard in the bottom of the basket. Then put vegetable scraps from your kitchen on top of the cardboard. Water thoroughly. Place crumpled newspaper on top of the vegetable scraps to mask odor. Water the feeding baskets and add vegetable scraps and newspaper at least once a week. 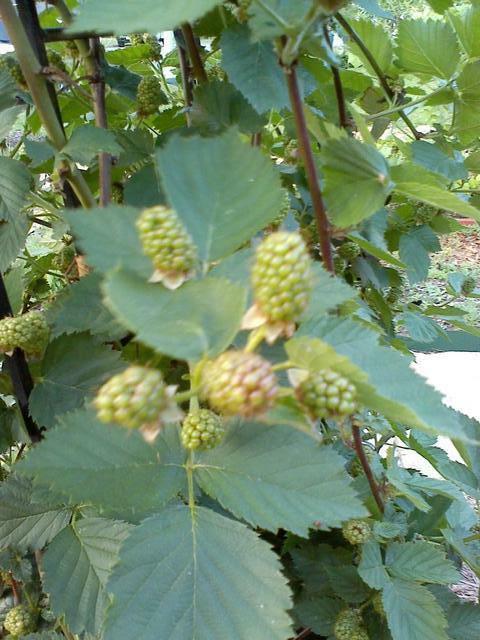 This will nourish your garden and will reduce the need for water. 3) Insert soggy wet cardboard into the soil around the plants twice a week during the heat of the summer. Soggy wet cardboard can also be used or mulch on top of the soil around the plants. 4) Once plants have started, be sure to mulch your garden well to prevent the soil from drying out. Soil is a living thing teaming with microbes that require moisture . one 4' x 8' raised bed made of concrete blocks filled with vegetable plants and flowers -- This bed also includes a trellis and a wire feeding basket to eliminate the need for fertilizing the garden and also to reduce the amount of water needed for the plants. one 6' diameter keyhole garden donated to our organization by Leon Smith of Keyhole Farm. the Winding Garden--an approximate 4 foot wide, 180 foot long bed. The soil for the Winding Garden has been prepared according to the lasagna method--layering cardboard, newspaper, leaves, and other organic matter and topping the surface with a two-inch layer of compost. In addition, each bed will be fitted with a feeding basket and an olla for water conservation. Before planting, gardeners will need to add a layer of garden soil to mix with the compost. To date, 12 of the 27 spaces in the Winding Garden have been assigned to gardeners. The entire back row of the 180 foot long bed is planted in non-GMO corn and sunflowers which should have high visibility from Naaman School Road. Instead of reading about us--why don't you join us? We meet every Monday night from 6:30 to 7:30pm at 216 East Kingsbridge Drive Garland 75040. Our meetings are open to the public. The rhubarb, one of the perennials I planted last year, made a comeback. Tonight I experimented and made up a recipe for my version of a rhubarb, strawberry, stevia leaves Italian ice--all the ingredients from my own urban garden. It's in the freezer now. I'll let you know how it turns out. 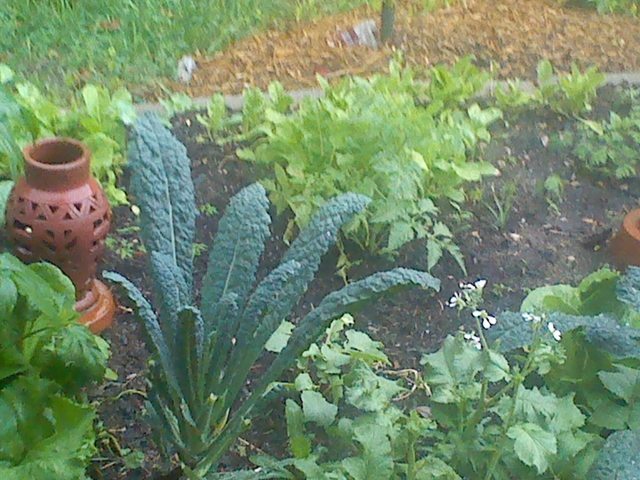 View of my greens garden after the rain. Hurrah for the rain! We will dedicate Garden Plot 4 to Mother Nature. We can see now the park area is designed so that any deluge of rain will flow through plot 4 and down to the creek. Plot 4 will become a walkway to access the backs of the gardens. We will keep it clear of plants. When things dry up a little bit more we will put the soil (from plot 4 that washed away) back in other garden plots. 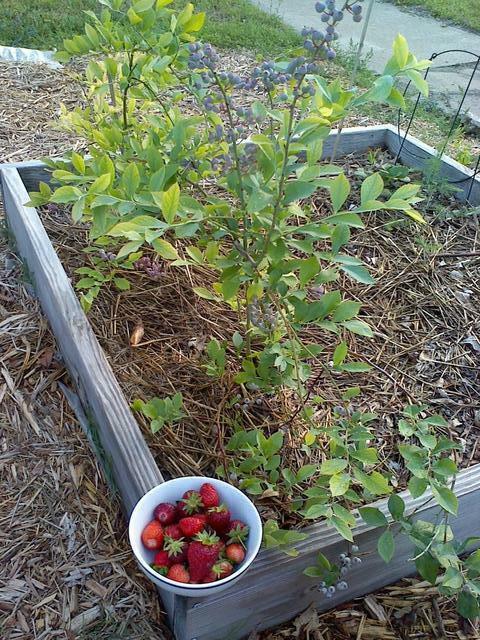 At about 9pm on Wednesday, May 7, I put four pots of strawberry plants on a pallet in our mulched area--three black pots and one larger green pot that contained two strawberry plants. I thought about cementing them to the pallet with gorilla glue, but then didn't. Today when Charlie and I walked down to the Garland Community Garden to check on things, I saw the big green pot is missing. The thing that puzzles me is why the thief only took the big green pot and not all four pots? Perhaps they wanted a Mother's Day present? By the way, mothers, if you get a strawberry plant in a green pot for Mother's Day. . . please inquire regarding its source. Everyone says it: All community gardens can expect to have theft -- from people and animals. I refuse to be cynical about this. Going forward, I expect people to do better. There is no need to ever steal anything from the garden. This garden belongs to the people of the City of Garland. Anyone who removes plants from the garden is stealing from their own community and robbing others from the chance of enjoying and learning from garden. Furthermore, it is totally unnecessary to steal from our garden. Those who want or need plants can attend our meetings for Loving Garland Green. Many of our members have plants and seeds to share. In the meantime, we are looking into installing sensors in our containers to enable us to track a stolen container to its source. And, by all means, if you see that a friend has a new green container with strawberries in it, please inquire as to where they got it. 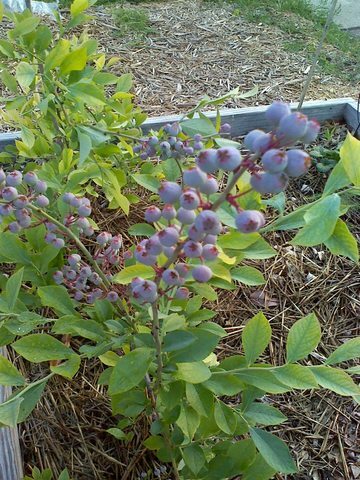 Urban gardening can cure many things that may ail residents in a community. In addition to all of the above, urban gardening also has been shown by many studies to improve local economies by creating new markets and supporting existing markets. Well I didn't until yesterday when I was busy at work finishing up our latest installation--the Winding Garden--at the Garland Community Garden. I was on my way to get a bucket of water for my dog Bubbles who supervises my work down at the garden. I looked like a chimney sweep as I had already been shoveling compost for about 4 hours when Monroe drove up in his truck. Turns out that Monroe's family once owned much of the land in the area around the location of the Garland Community Garden. There is even a street named after his family in the Firewheel residential area. Monroe lives on the corner of Talley and Todd. In addition to other land around here, his family once owned what is now the Provence area of Firewheel. Talking with Monroe, I learned much about the history of the community in which I live. For example, I did not know that in 1927 a tornado wiped out a considerable part of Garland and several people, including a former Mayor of Garland, S.E. Nicholson, were killed in that tornado. In fact tomorrow will be the anniversary of that deadly event. Around 3am on 9 May 1927 a terribly violent storm moved from southwest to northeast across Dallas County. People in Dallas were awakened and amazed at the ferocity of the clouds and near-constant lightning display. In Garland, the storm dropped a tornado that killed 13 people and decimated three city blocks. Monroe told me that he lost an uncle and an aunt in that disaster. 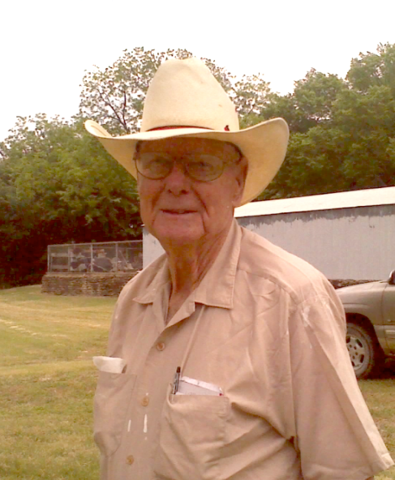 Monroe, the retired City Fire Marshall of Richardson, resides on 4 1/2 acres of land at the corner of Talley and Todd that he shares with chickens and 21 goats. He invited me over to meet the goats. I will be visiting them one of these days soon. In fact, I'm already considering the possibility of asking Monoe if he will loan Loving Garland Green two or three of his goats to keep the meadow down at our garden. Of course we would have to be very careful to tether them so they can't reach the produce. When I look at the picture above, I'm now curious about those pieces of paper and the pens. I wonder what he makes notes about? I asked him if he used a computer, but he doesn't. I was going to tell him about Loving Garland Green.org, but I figured he knows where we really are--at 4022 Naaman School Road. Well, I didn't either until yesterday and furthermore, if I hadn't been gardening, I still wouldn't know Dale. Dale also saw me out urban gardening in the Garland Community Garden yesterday and stopped by for a chat. Dale is a chef by trade. Like many industrious Americans these days, Dale also has a second job. He drives a truck and delivers for Swan Food. Dale's dream is to teach people how to cook healthy food. Dale is also interested in growing healthy food and has a garden at his home here in Garland. Recently he purchased some second-hand school lockers, laid them down on their backs, took the doors off, and converted them into almost ready-made raised beds. 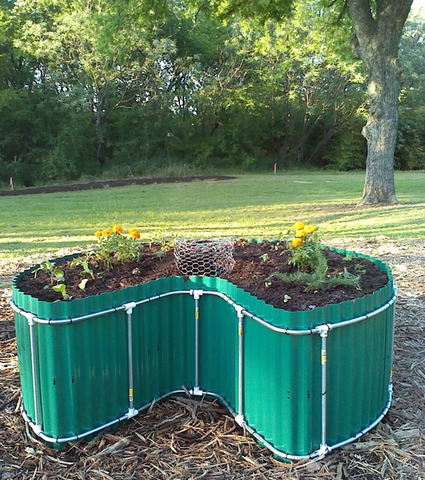 It's absolutely amazing the ingenuity of people when it comes to creating garden containers. Perhaps I can talk Dale into teaching us where to find old school lockers and teach us how to create these beds. With a little paint they could be quite attractive. 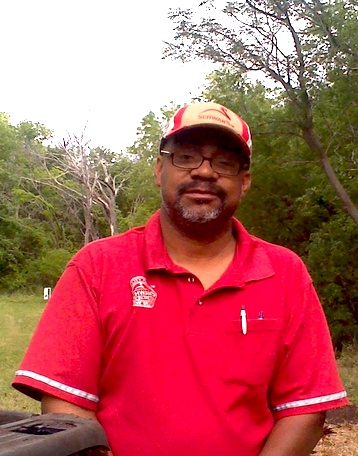 Dale took all the information about Loving Garland Green and said that he plans to attend our meetings. Now do you see why I think Urban Gardening is a social cure-all? Leon Smith, proprietor of Keyhole Farm, generously donated one of his lovely keyhole garden kits to Loving Garland Green. 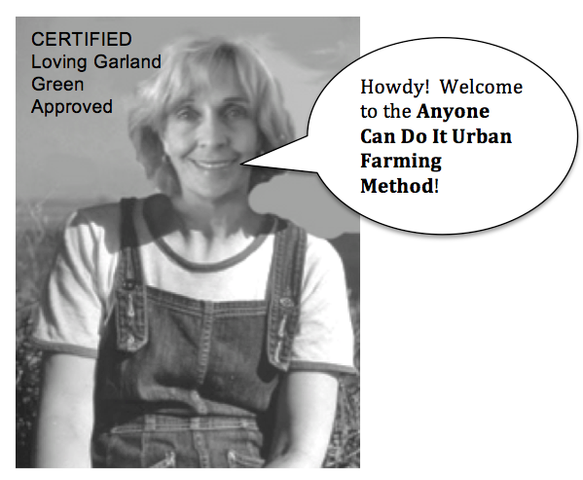 You can now see it at 4022 Naaman School Road--location of the Garland Community Garden. 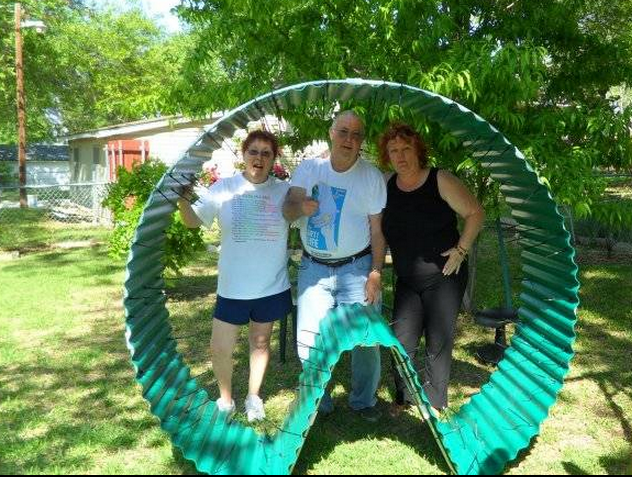 On Friday, May 2, Gene and Margie Rodgers along with Jean Shortsleeves and I assembled the supporting structure and walls for the keyhole garden. On Saturday, Gene and Margie brought it over to the park and there we built the soil. Many Loving Garland Green members stopped by to assist as it takes a while to build up the soil--(wet cardboard, leaves, grass clippings,vegetable scraps, compost and garden soil). We began at 1PM and concluded at about 6 PM. Mayor Doug Athas took time out from his busy day to stop by for a while with his son. It will be interesting to see if the plants grow as fast as the ones in Leon's keyhole garden. 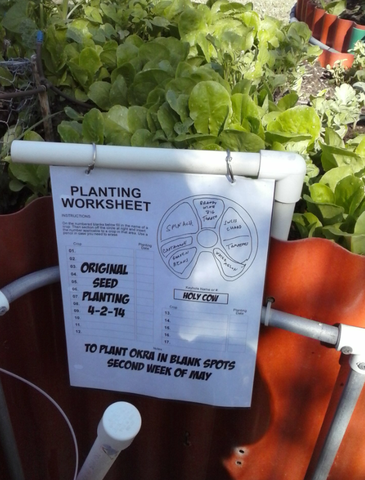 Below is a photo of one of Leon's plant sheets. The photo was taken on April 25. Look at the size of the plants in this bed after only 3 weeks from seed. Stop by and see it for yourself as the keyhole garden format is unique. It has a feeding basket in the center of the bed. The basket extends down to the bottom on the bed and sticks out several inches over the top of the soil. Gardeners put wet cardboard and vegetable scraps into the basket. Once the plants are established, the gardener waters the feeding basket and not the bed itself (except during the heat of the summer). The roots of the plants seek out the nourishment and moisture of the feeding basket which also acts as a watering system. So you want an urban garden, but you don’t have the skills, tools or the money to build a lovely wooden raised bed. What can you do? One thing is certain: you can’t just stick something in the North Texas soil and watch it grow. It took me 10 stubborn years of gardening failures to learn that, but I’m making up for lost time. You will need to amend the soil, but again, that can get expensive with sphagnum moss, vermiculite, compost and garden soil combined with the wood for the frame, the hardware to put it together and the plants. Setting up a wooden 4’ x 8’ raised bed, enclosed by wooden sides will cost between $100 and $150. If you have someone from a nursery do the work, it will cost about $500. Inspired by Ruth Stout and her mulch gardens and folks like Leon Smith and Deb Tolman and their keyhole gardens, I’ve come up with a low-cost solution for successful urban farming. I have named it: “The Anyone Can Do It Urban Farming Method. Be forewarned: This is an experiment. However it is based on sound principles already established by others as mentioned. Imagine two 4’ by 4’ squares. The total space is 4’ x 8’—a total of 32 square feet per garden plot. 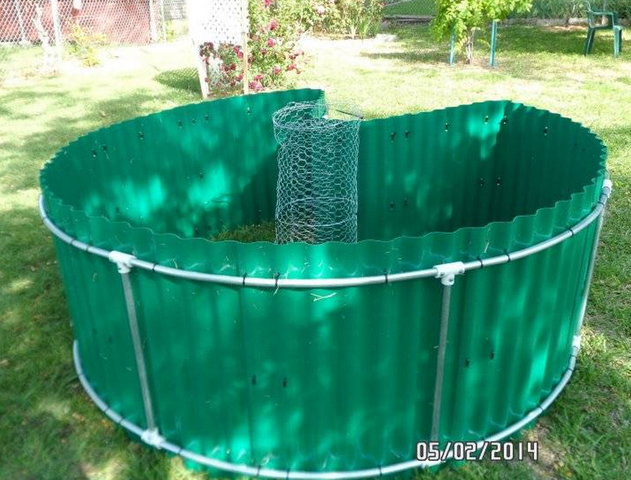 In the center of each 4’ x 4’ square there is a chicken wire basket, about one foot in diameter that is reinforced with four small bamboo poles. The wire basket extends down to the bottom of the bed and extends about 12 to 14 inches above the top of the soil. Total height of the basket is 2 feet. Wire cutter or very strong scissors. A mixture of leaves, cardboard, grass cuttings, natural fabric old clothes and rags, newspaper--Note: Since we are moving into the hot months, make your mixture at least two parts brown stuff and one part green because you don’t want your soil to get too hot. You will need enough of this mixture to build up to at least 8 inches high. Your plants. Use a mixture of transplants and seeds. Radishes and okra are almost always a sure bet. STEP ONE: Measure off a four-foot by eight-foot rectangle in a sunny spot in your yard. You can either mentally eyeball the space, or you can measure it off. Either approach is fine. Wet cardboard and cover the 4’ x 8’ space. Make sure to soak the cardboard well. The cardboard will attract good soil microbes. Cardboard is also essential to help with water retention and aeration. In addition, for some reason tiny soil creatures love to eat cardboard and turn it into soil. Cover the cardboard with a layer of leaves. Throw some old clothes (cotton or wool only) on top of the leaves. Wet thoroughly and walk around on top of the garden. Put another layer of wet cardboard. Throw some green on the pile (grass cuttings, or leaves from recent hedge trimming). But remember to limit the green to no more than 1/3 of your soil mix. Etc. Until you have built a 4’ by 8’ mound that is at least 8 inches high. 10. Spread a 3 to 4 inch layer of compost on top of your garden. 11. Spread a 4- inch layer of garden soil on top of the compost. Cut two pieces, from the two-foot wide chicken wire. Each one is about 14 inches long. Bend the ends together to form a cylinder that is two feet tall and about one foot in diameter. You can connect the ends by bending the wire of each end together, or you can use pieces of wire or tie-wraps. Once the cylinders are made, insert four bamboo sticks, each about 18 inches long, through the chicken wire to stabilize the cylinder. (Weave the stick in and out of the holes in the chicken wire.) Put the four sticks equidistant around the chicken wire for balance. STEP FOUR: Insert the feeding baskets into the center of each four by four foot square garden you have built. Dig out a hole in the center. Simply use your hands to push your soil back and then push the soil against the basket once you have it positioned. STEP FIVE: Fill the feeding basket. Throw vegetable scraps, grass cuttings, etc. on top of the wet cardboard. Put more wet cardboard on top of that. Another layer of vegetable scraps. Plant your garden. Choose vegetables that you and your family like. I try to choose the most expensive vegetables that I like. For example: artichokes. I have three artichokes planted in my garden. Water daily for the first week to 10 days until the plants are established or until seeds sprout. After that, you won’t need to water more than once a week if you keep your feeding basket filled with wet cardboard and vegetable scraps. The roots of your plants will grow toward the feeding basket. However, check your soil daily by inserting your index finger into the soil at points in your garden farthest away from the feeding basket. At about an inch or so it should be damp. If it is not damp, wet cardboard, roll into cylinders and insert into the soil throughout the garden. You should do this anyway about once a week to aid in water retention and keep the soil aerated and damp.